The Seneca Nation and New York Gov. Andrew Cuomo (D) announced a settlement to their Class III gaming compact dispute on Thursday. The tribe agreed to share $140 million with local communities, or the full amount they would have received under the compact. The state will receive about $210 million while the tribe will keep the same amount in order to resolve a dispute over the exclusivity provisions in the agreement. 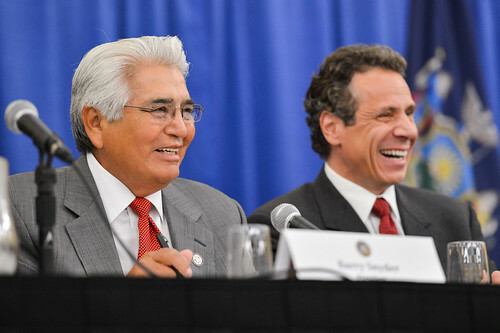 "Governor Cuomo did not start the dispute between the Seneca Nation and New York State, however, he has worked with the Nation to make the compact 'whole' once again," Seneca Nation President Barry Snyder Sr. said in a press release. "This agreement is in the best interest for all parties involved, and will ensure our Western New York gaming facilities will continue our exclusivity and that local governments in our region benefit from the casino revenue. We commend the Governor for his leadership so that both parties could come together to reach a fair and reasonable resolution on our disagreements." The tribe withheld more than $600 million in revenues from the state due to a dispute over exclusivity provisions in the compact. Non-Indian gaming facilities are operating in the tribe's territory. The video lottery terminal facilities will remain open but they won't be able to market themselves as casinos as part of the settlement. The state said it would enforce the tribe's exclusivity zone. The deal does not require state or federal approval. It ends mediation that the parties had entered into under the compact. To address future disagreements, the tribe and the state agreed to develop a new dispute resolution process.